HT-010110 - Haltech ECU Inputs - MAP Sensor - Pann Auto Performance - San Diego largest aftermarket automotive performance parts - What do you drive? 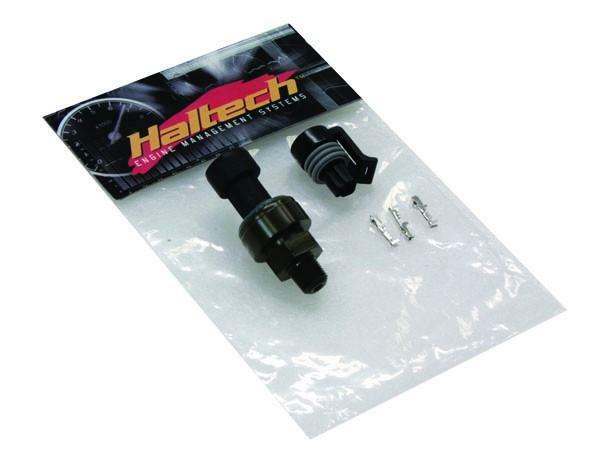 A Haltech MAP sensor (manifold absolute pressure) provides instantaneous pressure information to the electronic control unit (ECU) from the intake manifold – the amount of boost or vacuum in the intake manifold. This is necessary to calculate air density and determine the engine’s air mass flow rate or in other words engine load. Engine load is used as a reference for all base fuel and ignition maps. A 1 bar MAP sensor is capable of reading intake pressures below or equal to atmospheric pressure, for this reason a 1 bar MAP sensor is suitable only for naturally aspirated engines (ie not turbo or supercharged). A 2 bar MAP sensor is capable of reading intake pressures up to 1 bar of positive pressure above atmospheric (otherwise known as boost). This is equivalent to around 14.7psi of boost or 100kpa of positive pressure. 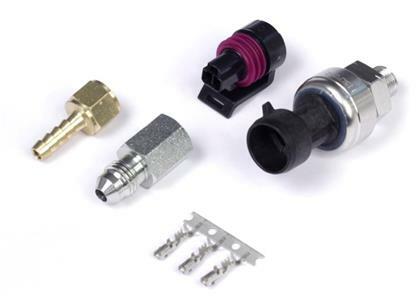 This sensor is suitable for turbocharged or supercharged vehicles running 15psi of boost or less. A 3 bar MAP sensor is capable of reading intake pressures up to 2 bar of positive pressure above atmospheric (otherwise known as boost). This is equivalent to around 29.4psi of boost or 200kpa of positive pressure. This sensor is suitable for turbocharged or supercharged vehicles running between 15psi and 30psi of boost.